My sister Kate revealed this to me last week. 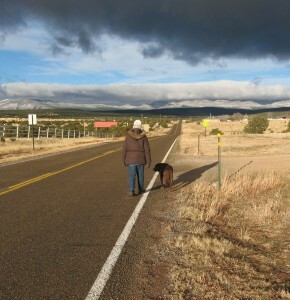 She lives out in the country southeast of Albuquerque and in the company of her Chocolate Lab, Susie, daily walks several miles of the highway running past her home. 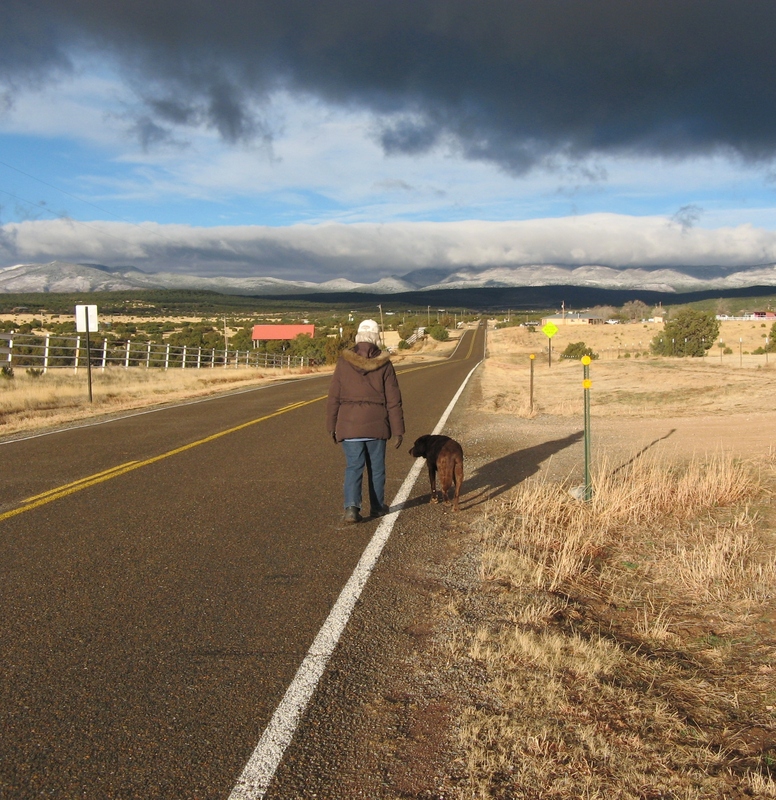 For years she has been collecting and disposing of all kinds of trash pitched from passing vehicles, trying to keep the road pristine. And then one day she had an idea. Kate is a software consultant who does a lot of accounting for clients, and she has a very analytical mind. Out of curiosity, she drew up a chart and started keeping a record of what she was finding. It was the usual– mostly plastic bottles and bags, soda cans, beer cans and bottles, paper cups, food containers, and all manner of papers as well as occasional metal and wood. It may interest you to know that, no matter how charming their commercials, Budweiser is hands down the greatest source of beer trash along the road. As a community service, perhaps those magnificent Percherons could be deployed to haul it off in wagons. Maybe I have said this before. Inquiring as she is, Kate takes a look at the papers she finds, and it’s not all wrappers. Her interest is cautionary. Everyone should know that there is no privacy in litter. The other day, she found a piece of paper that fascinated her. It was a receipt from a grocery store, one of the big chains. She immediately noticed that the customer was a recipient of food stamps, and the sight of how they had been used was distressing. She went home and drew up another chart on the purchases and emailed it to me. Impressed, I asked if I could write about this and she agreed. The total for the purchases was $84.45. Food stamps covered everything except paper plates and a carton of Budweiser totaling about $23.00 In the general category of food was the following: two bottles of Gatorade and one bottle of Squirt; a Baby Ruth, Milky Way, and bag of M&M’s; Lays Chips, Chips Ahoy, Hostess Zingers, a Sara Lee cake, and two packages of bakery donuts. The most substantial foods included hot dogs, breads, lettuce, potatoes, eggs, lemons, and bananas totaling about $23.00 out of the $58.00 food stamps covered. That meant that about $35.00 in food stamp funds had been invested in what one would call junk food. Far from nutritious, it might actually be detrimental to health. And realizing that there is a growing resentment toward the food stamp program, I wondered how financially burdensome it actually is to the individual taxpayer. Over the weekend, Kate and I got together and she drew up another chart to figure this out. We looked at the year 2012, for which the best statistics were available, and Kate defined the premises for our analysis: (1) The government spent $3.8 trillion in 2012, (2) it raised $2.2 trillion in income tax, (3) that amount covered 58% of total spending, and (3) total spending on food stamps was $78.4 billion. Choosing figures that were easy to follow, Kate calculated that a married taxpayer with an adjusted gross income (AGI) of $100,000 paid $430.34 in 2012 to cover the food stamp expense or $35.86 a month. Next we looked at a married taxpayer with an adjusted gross income of $1 million. Now the annual figure climbed to $6,726.07, and the monthly amount was $560.41. These figures and the review of the shopping receipt made quite an impression on me. Of course there may be many people who use their food stamps more wisely than we had seen in the tossed receipt. Nevertheless the sight of that waste plus the figures on the personal cost to taxpayers were eye-opening. I had thought the individual figures would be much smaller, and I understood better why many people feel so aggrieved. But again, what do you do about it? As Kate and I talked, I brought up a quote I had seen a few days earlier: “Government’s first duty is to protect the people, not run their lives.” Actually, that was a quote by President Ronald Reagan. When I woke up the next morning, the first part of that quote was on my mind. So what are we paying for protection? Soon Kate and I were back at the table looking at different figures. In 2012, defense spending totaled $645.7 billion. Kate ran the numbers again. At an AGI of $100,000, a married taxpayer paid $295.36 for defense spending each month and a total of $3,544.30 that year. A married taxpayer with an AGI of $1 million was covering $4,616.31 monthly and $55,395.71 annually. Wow. These latter figures are over eight times as high as the food stamp burden. If the issue for taxpayers is where our revenues are going, why is there so much complaint about the one thing and not the other? This was an interesting exercise and very revealing about how easy it would be to manipulate statistics. (Anyone should feel free to double-check ours.) I came away from the experience thinking that it would be very revealing for anyone. Categories of spending get very personal very fast. I can vouch for the fact that reality shifts a little bit when you do this. And the figures–which could be derived by formulas simple enough for anyone to compute with tax return in hand–might serve to launch some very interesting discussions about needed changes in the way government works. Considering all the discontent at large, it may be time. I will leave it at that for the moment; but thanks to a fascinating bit of litter, I expect I’ll revisit this subject soon. 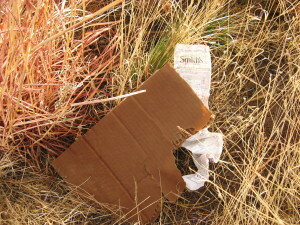 Your blog was very interesting and illustrated three kinds of waste: (1) the waste strewn along the road, (2) the waste in the food stamp money, and (3) the waste used in the military. I am not against helping to feed people who really need food. But I have been in line at the grocery behind a person with an EBT card and have seen the garbage in her cart. The military is definitely a necessary evil. However, money has been wasted there, too, as I am sure you are aware. Hank Johnson, representative from Georgia is trying to force the Pentagon to buy tanks that are too flimsy to hold up under fire. Why? He got campaign contributions from the manufacturer. ETC. And we haven’t even addressed the issue of waste. If we had good data on how much of our tax dollars were being frittered away uselessly, our blood pressures would really rise. And then, one person’s waste might be another person’s value – NEA for instance Oh, my!